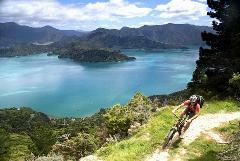 The Queen Charlotte Track is regarded as New Zealand’s best single track ride. This is a challenging track, with many technical stages, and riders do need a good level of mountain bike fitness and skill to enjoy the trip. It is advisable to talk to us about the best option for your riding experience. Track Surface - the track is predominantly clay based, which means that is very slippery when wet, but does drain reasonably quickly. The track has many varied hazards ranging from tree roots, rocks, water ruts, bridges, steep drop-offs, and steps. The smoothest section is from Mistletoe Bay to Anakiwa. 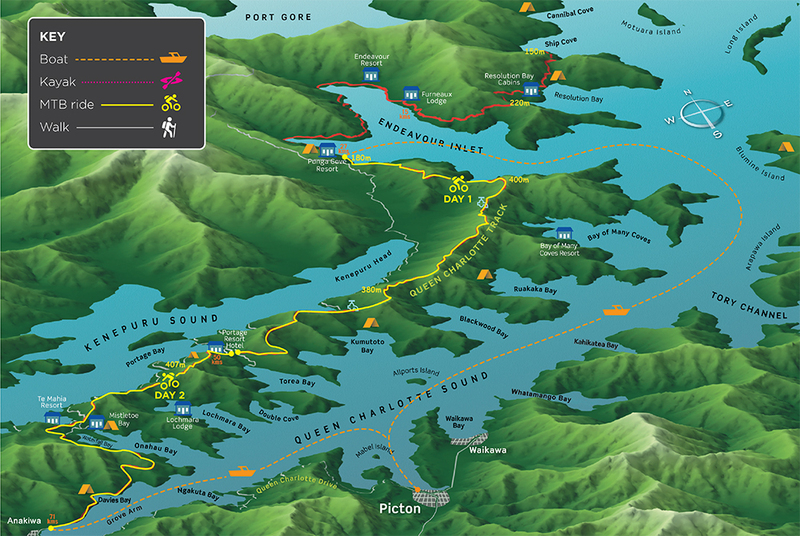 The sections from Ship Cove to Punga Cove are closed from 1 December to 28 February each year. The rest of the track is open all year. Novice - Competent and confident cyclist. Limited off road experience. 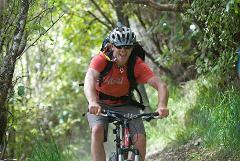 Intermediate - Confident riding a mountain bike off road. Aware of ‘single track’ conditions. Expert- Frequent user of single tracks. Good knowledge of riding techniques and bike maintenance. •Novice rider - a confident rider on roads or forest tracks. 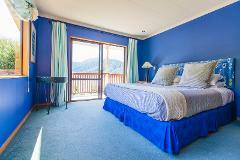 •Intermediate – has ridden some single tracks, but not experienced. •Experienced – regularly rides single tracks. 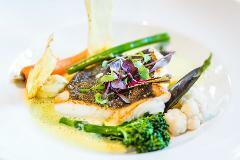 Your journey begins with a 1 hour boat ride to Ship Cove or Punga Cove. The ride out of Ship Cove is quite steep, and you will need to push your bike for the first half hour of this section. After descending into Resolution Bay from the Ship Cove saddle, you have a long but moderate climb to Tawa Saddle and slow downhill to Furneaux Lodge. A rewarding ride around the head of Endeavour Inlet with some technical sections caused by tree roots and drop offs around Camp Bay. Climbing steeply away from Punga Cove to join the Queen Charlotte Track the sweeping views begin to appear. Today’s ride is about lots of up and down! 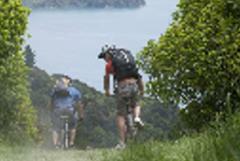 You will be riding along the ridgeline between the Queen Charlotte and Kenepuru Sounds. Stunning views all day, but the terrain is challenging. Lots of sharp corners, steep drop offs and of course those hills. Whilst the inclines aren’t long they are reasonably sharp, and likewise the decline can be sharp. The ride is worth it, but riders definitely need to be experienced mountain bikers to enjoy it. You can ride the road on this section if you prefer. Portage to Mistletoe Bay – begins with long steep climb, lots of pushing, switch backs on descent. Some may prefer to take the road for this section. Mistletoe Bay to Anakiwa – narrow undulating track at first, wider and more moderate mid section, then long descent into Anakiwa. Riding down to sea level you will come upon some particularly beautiful virgin native bush which leaves you with a lasting impression of what must have been before man arrived. The harbour of Anakiwa comes into view and so to does the end of the Queen Charlotte Track. Our bikes are specially prepared for the terrain of the Queen Charlotte Track. They are maintained daily by a Shimano-accredited bike mechanic and replaced on a regular basis. Although we have more than our fair share of good weather in the Sounds, you should be prepared for adverse conditions at any time of the year, hence the need for warm clothing and good wet weather gear. Vehicle Storage - If you wish to leave a car in Picton during your trip, there is public Car park next to our office, cost is $5 for 24 hours. Please be at our office at least half an hour prior to departure, for a bike fit out and briefing. You will be booked on a 8am or 10am water taxi in summer (or a 9am on winter) –Please check with us if you are unsure of your departure time. Important steps have been taken to protect the future of the Queen Charlotte Track to ensure it will always be a place of rare beauty and freedom. The Land Co-op pass has been introduced to ensure this. These passes can be purchased from our office if required.